I want my own domain. I’m unsure how I want to go about this, who would host it, how I’d transfer all of these posts, or anything . . . but it will happen eventually. I’d love to get to the point where I am posting at least twice per week. I took a small hiatus recently so I could focus on editing for Michele, school, and family, but I’m back now and hopping in full force. I am thankful for weekend snuggles (and anytime snuggles) with my two favorite guys – the hubs and the little man. What are some of your favorite book blogs, booktubers, bookstagram, and podcasts? I LOVE this page, especially on Thursdays. 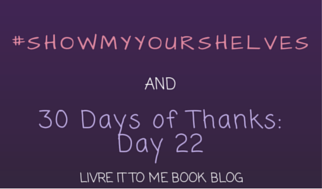 Their Thursday Blogger/Author/Reader/Editor confessions get me through the day. I laugh, I scowl, and sometimes I tag a few posts because I can benefit from the comments. They post great book suggestions, works in progress from authors, spotlights, and great book-related clothing and other products. Platypire Reviews is a great mixed bag of awesome. They are a wonderful team of reviewers who adorably refer to each other as “Platypire Bob” and “Platypire Maribel”… like really, I sort of want to pinch their platypire cheeks. They have great senses of humor and post fantastic graphics. They’re actively reviewing all genres of books, and with such a large team they’re able to consistently post. Another great thing about Platypire Reviews is their Deja Revu blog post roundup; they take blog post submissions from other blogs and round them up by genre in a weekly post. You can view that HERE. On top of well-written and thoughtful reviews, The Literary Connoisseur shares some wonderfully relevant articles and blog posts from around the web. I’ve shared a few of their posts on my own blog page, loving the graphics they share, including humorous memes and cartoons. There is nice variety in the books reviewed on this blog, which keeps me on my toes when looking at book posts. This blog always posts some really great book suggestions and teasers. I love her mail call posts and hope to eventually be in the same boat where I have a plethora of books sent to me from publishers each month. (One day! Consistency will be key for this goal. haha.) I also love that she has such a great variety in the books she posts about. There’s a little something on her blog for everyone. I look forward to taking part in this year’s BookBlogWriMo, hosted by The Perks of Being a Book Girl (another really awesome blog to check out!) If you want to sign up at any point, jump right in! 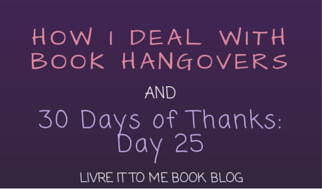 What have you been up to since BookBlogWriMo 2015? This past year has gone by in a blur. I’ve been editing like crazy and just finished up Michele’s most recent piece After The Fall. It’s always a joy working with her, and I count my blessings every day to be going strong as her editor for the past 2+ years. I’ve taken a much more lengthy hiatus from this blog than I would have liked, but life is pretty hectic lately. With a one-year-old, two jobs, school, and family . . . well, it’s easy to see why I’ve been less active on here. I have these next couple weeks off, so I will be dedicating some more time to blogging. This BookBlogWriMo will definitely be different than the last one. I had a two-month-old at that point and was in no state to keep up with the daily demand of posting, let alone staying awake for extended periods of time. 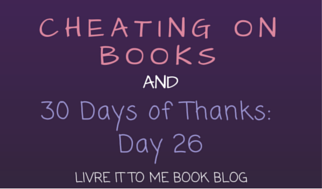 I look forward to taking part in this year’s BookBlogWriMo, hosted by The Perks of Being a Book Girl. If you want to sign up at any point, jump right in! S.E. Hinton – She was the first author who inspired me to do more. She wrote my favorite book, The Outsiders, as a teenager. J.K. Rowling – Growing up with Harry Potter completely changed my life. I actually can’t imagine what life would have been like without the yearly book and movie releases. I love that I can keep going back to these books and relive everything all over again. I’m so thankful to JKR for introducing me to such a wonderful world. 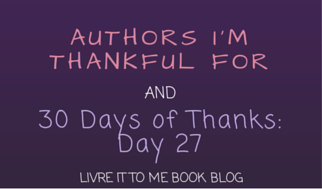 Michele G. Miller – Blogging is pretty great, especially because you get to meet awesome authors. Sometimes these authors become your friends. Sometimes you get to do work for them. I get the best of both these worlds – I edit her incredible books and have gained a friend in the process. I am thankful for family tradition and Thanksgiving. I love that I can count on certain things to happen at this time every year. I love that I get to spend time with my family and closest friends. As wonderful as a life filled with books would be, I do partake in other wonderful things every so often. 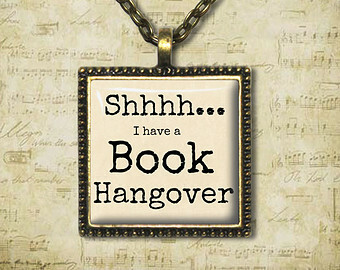 “What is a book hangover?” you ask? Well, it’s not that complicated. Actually, it’s quite similar to an alcohol- induced hangover. They occur when you imbibe in too much great literature. It’s that moment when you shut a book and realize that you don’t have anything left; that world has closed off to you and you’re left at a loss. Your brain stops functioning a bit, you potentially have a bit of a headache, and nothing makes sense. You feel like something has been pulled from you and you’ll never get it back. 1. Think – Jeesh, what a concept! That’s right. I think about what I just read. I let it soak in. It makes me feel a little loopy, and perhaps gives me a bit of a headache, but I sit and think about it. Let it stew. What did I just read? What did it make me feel? Why do I think it made me feel that way? 2. Feel That Loss – Acceptance is important here. I take that emotional trauma and the despair of closing that book, and feel it. Embracing what you feel helps to make those next steps easier. 3. Seek Out the Author – This sort of happens at the same time as feeling the loss. When I finish a book that I really enjoy, I tend to seek out the author to find out what’s next. If it’s a series, I like to know when to expect the next book release. I go forth to ‘like’ the author’s page on Facebook and other sites and learn more about their other potential books. 4. Let Go and Move On – Now comes the moving on bit. Once I have that piece of closure in knowing more books follow or that there are other fish in the library of the sea, I am able to move on. I place that book on my shelf and move to the next indulgence, starting that process all over again. Will I ever learn? I hope not. I am thankful for snow boots and rain boots, and other protective weather gear! I love books. I want all the books. Every bit of them. My collection is constantly growing. We’re definitely in dire need of another full-sized book shelf. Heck, I’d settle for the library in Beauty and the Beast. Then we’d be all set! !